I've been preoccupied with my fifth book, Birding Australia's Islands, which is scheduled to be published next year. Hence I've been neglecting my blog. Since my last posting, I've visited Phillip Island, Trin Warren Tam-boore, Werribee's Western Treatment Plant and Cape Liptrap. I've also continued my daily walks. This morning I saw an Eastern Rosella - not very common around here. I've also seen a pair of Galahs occasionally. Once an Australian Pied Cormorant flew over and one day last week, I saw a pair of Pacific Black Ducks sitting happily on a fountain in someone's front garden. The purpose of my trip to Phillip Island was to get a photo of nearby French Island for my book. This I achieved, taking the ferry from Cowes to Tankerton. Black-faced Cormorants sat on the Cowes jetty. The population of Cape Barren Geese on Phillip Island has increased enormously since my last visit, which makes sense as just about every goose we saw had several goslings. The only noteworthy bird I saw on the trip was a Fan-tailed Cuckoo. I saw (and heard) several at various places on the island. I saw them again the next week when I visited Trin Warren Tam-boore. I always enjoy walking around this wetland. I see waterbirds of course, but also honeyeaters, finches and fairywrens. On this occasion, as well as Fan-tailed Cuckoos, I heard, but could not see, Horsfield's Bronze Cuckoos too. I watched a Peregrine stoop into a large flock of feral pigeons (or Rock Doves, if you will). He didn't catch one while I watched, but he certainly put a falcon among the pigeons. 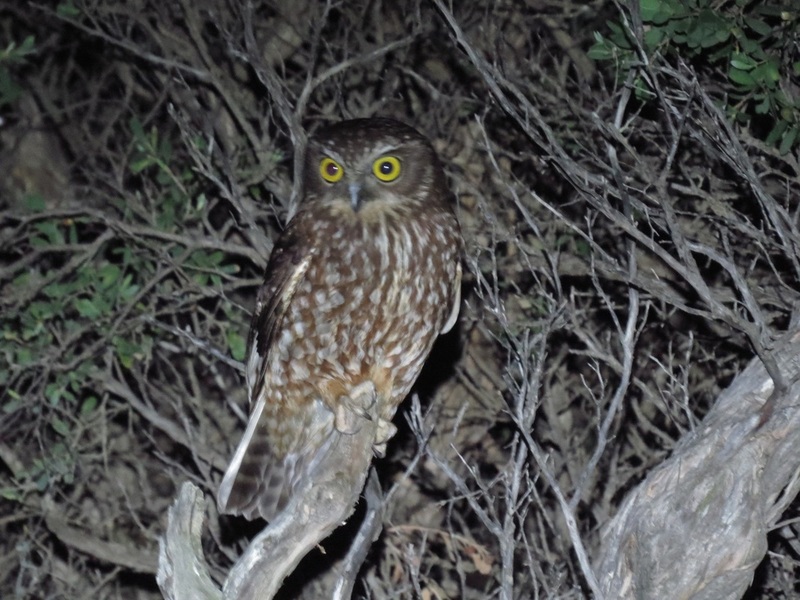 It was because of Graham's presence, that we visited Cape Liptrap, to look for Moreporks. Of course we asked James Mustafa to join us. And of course we had a successful trip. It was cold, but the owls gave us a warm inner glow. And it can't have been all that cold, as we all enjoyed ice creams on the way home. We saw two owls. I thought it was three, but the boys persuaded me that the last two sightings were of the same bird. The first bird we saw had a favourite perch. It returned to sit on this particular tree again and again, giving us ample opportunity to admire its big yellow eyes. Now spring is half over and my book is progressing well. And I still have an embarrassingly long list of birds I haven't seen this year. I will do my best to rectify this when I visit Chiltern next week.